The MMA (or mixed martial arts) phenomenon has been sweeping the nation ever since it became popularized by Ultimate Fighting Championship in the mid 90’s. The sport itself requires countless hours of training in a variety of forms of combat to not only be ready to step into an octagon but also become a worthwhile competitor. These men go through more than just a few jumping jacks and squats to enter the field of combat. They must train in multiple disciplines such as boxing, kick-boxing, and jui jitsu in order to become a strong opponent and put up a decent fight. All the while they are learning new combat skills, they must also do intensive endurance training in order to not gas themselves out within the first few minutes and keep their bodies going at a steady pace throughout the duration of the fight. Riding the wave of UFC’s sprouting popularity, a lot of gyms have opened up solely dedicated to training in MMA. These places are much more costly than an average gym membership but with the added bonus of classes and unique training equipment designed to develop beginners and advanced competitors the skills they need to become mixed martial artists. However, the biggest demand MMA training takes upon us is time. Even if you had the funds to afford a costly MMA gym membership you may not have enough time to dedicate yourself to it in order to receive the full and proper training. Luckily, one of the most popular UFC fighters of all time George St Pierre has come up with an at home workout program called Rushfit that gives you the luxury of training GSP style. This six DVD program is designed by GSP and his trainer Erik Owings to go through a series of workouts the champ himself performs in the comfort of your own home. When time is not on your side, a home workout program is the next best thing. This program is definitely intense and might be challenging at first for beginners but if you want to properly train in MMA then this is a good start. It’s really a testament to the program’s quality seeing that GSP pulls no punches and forces you to stretch and sweat so that in time you’ll be able to hang with the big boys. Throughout the GSP Rushfit review of the program I noticed that there are many elements to MMA training that I previously didn’t consider. For one, stretching and flexibility is a must. Supplementing your training with some yoga exercises would be highly beneficial. Surprisingly enough, there are no workouts designed to increase your threshold of pain because in the end, all of our bodies have weak points that can be exploited. MMA training doesn’t teach you how to resist an arm bar for a longer period of time but instead to protect yourself from ever being caught in that move. Some people just have a higher tolerance of pain than others but with proper training, you can learn to defend yourself properly and become a real competitor that may one day step into that cage and become a champion. 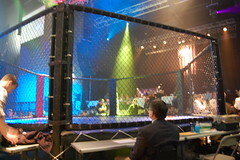 This entry was posted in Fitness, MMA and tagged mixed martial arts, mma training by Russell Jensen. Bookmark the permalink.